Polio, a deadly virus that many believe had been nearly eradicated because of vaccinations, has more recently had a resurgence in the Middle East and Africa, sparking public health officials to warn Americans that, like with the recent Ebola scare, the polio virus is just a plane ride away. To raise awareness and critically needed funds to help fight the crippling disease, Sam Houston State University has joined with the Huntsville Rotary Club to host a series of events on Jan. 29. “Vaccination awareness is so important because many people are forgoing the practice of vaccinating their children,” said Darren Williams, associate professor of chemistry and Rotary Club president. SHSU’s activities will feature four main events, beginning with an iron lung display from 9 a.m. to 5 p.m. in the Lowman Student Center Mall Area. Students can stop by the information table—staffed by student organizations—where donation jars will be used to see which college raises the most money. Donors also can take photos in front of a backdrop to share on social media about the fundraising campaign. In 1959, there were 1,200 people using iron lungs in the United States. This number fell to just 39 by 2004, according to Williams. The iron lung that will be on display is owned by Hugh Summers, a Rotarian from Palestine, who displays it at Rotary conventions and youth events. See the tank-like respirator used to aid polio patients from 9 a.m. to 5 p.m. in the LSC Mall Area. Learn about Rotary's international immunization efforts over a free lunch at noon in the LSC Ballroom. RSVP toRotaryClubOfHuntsvilleTX@gmail.com orDarren Williams at 936.294.1529. Featuring Berger and three SHSU professors, at 2 p.m. in the LSC Theater. Take the half-k challenge, donate to polio immunization and get a free T-shirt. At noon, faculty, staff and community members can learn more about worldwide polio vaccination efforts over a complimentary lunch in the LSC Ballroom. “Mike Berger, the Rotary District 5910 polio fundraising chairman, will discuss the practice of holding a National Immunization Day in countries where the vaccination effort is the strongest,” Williams said. “He participated in India’s NID, and he will share his photos and experiences of traveling to India’s remote villages to vaccinate children. Seating is limited, and those interested in attending are encouraged to RSVP toRotaryClubOfHuntsvilleTX@gmail.com or toWilliams at 936.294.1529. Following lunch, a panel discussion on the logistics of global immunization, the history of disease eradication, and the safety of modern vaccines will feature Berger, associate professor of history Jeff Littlejohn, associate professor of bacterial physiology Todd Primm, and will be moderated by associate professor of chemistry Donovan Haines. It will begin at 2 p.m. in the LSC Theater. Finally, the day will end with a 0.5k Fun Run/Walk in the LSC Mall Area at 4 p.m. The run will raise funds for polio eradication and awareness of the societal benefits of vaccination—and allow participants to get a little exercise. Runners and walkers are required to give a donation for participation, and all participants will receive a commemorative T-shirt. While polio case numbers have never been lower, the disease is still pervasive in three countries; Nigeria, Afghanistan and Pakistan have never stopped transmission of the wild poliovirus. However, a funding gap means immunization campaigns are being cut in high-risk countries, leaving children more vulnerable to polio. If polio isn’t stopped now, the disease could stage a comeback, affecting an estimated 200,000 children every year. 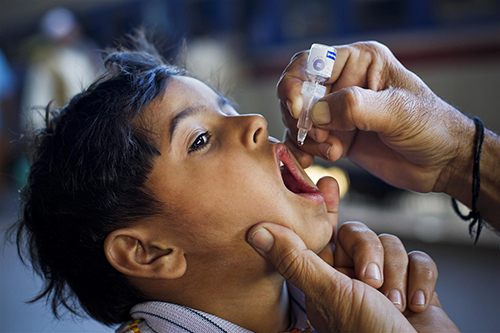 The effort will raise money for Rotary International, the volunteer fundraising arm of the Global Polio Eradication Initiative—a public-private partnership that also includes the World Health Organization, the U.S. Centers for Disease Control and Prevention, UNICEF, and the Bill & Melinda Gates Foundation. Donations to this fundraising campaign are eligible for a 2:1 match by the Bill and Melinda Gates Foundation, meaning for every $1 donated, $3 will go towards the fight to End Polio Now, Williams said. Through these efforts Williams believes eradication is foreseeable, especially since children can be protected from the disease for life for as little as 60 cents worth of oral vaccine. “This fundraiser comes at an important time in the fight to eradicate polio, which would be only the second human disease to be eradicated,” he said. “We did lose some ground in the fight against polio in those countries where it is still endemic. Suspicion and cultural fears contributed to a slowdown of vaccinations—especially in Pakistan,” Williams said. “But Rotary International and the World Health Organization have worked to increase security and to allay fears so that the task of vaccinating the remaining children in those countries can be completed. For more information, or to donate online, visit huntsvillerotary.org/EndPolioHuntsville.cfm.